Controversy over the new Graceville community garden continued to rage at last week’s Brisbane City Council meeting, with rebel councillor Nicole Johnston repeatedly asking the administration to table a report on the garden. The 33-page report was funded by Council and prepared by the Benarrawa group, a small community-managed organisation based in Graceville which supported the garden. Cr Johnston represents the ward (Tennyson) where the garden is located, but opposed putting the garden in Faulkner Park. However, a year-long campaign by garden advocates and the presentation of a petition convinced the ruling Liberal National Party to approve the location. Since the controversy began Cr Johnston, who fell foul of the LNP over establishment of a bus depot in Sherwood, has resigned from the party and now sits in the Council as an independent. In Council’s weekly question time Cr Johnston asked Neighbourhood Planning and Development Committee chairman Amanda Cooper to table the Benarrawa report “so that every councillor can see what is contained in this report prepared by the Benarrawa group”. 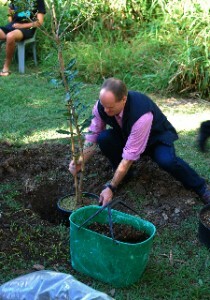 The community garden at Graceville was officially opened last Sunday. Cr Newman said hundreds of people attended the celebrations over a three to four hour period. “What I saw was a group of dedicated enthusiastic community people, who were absolutely delighted that they had a chance to go forward with this community garden,” he said. Cr Newman said it was important to put divisions over establishment of the garden into perspective. “I understand that this has been a controversial thing,” he said. I live in the area and was peased to see so many people from the local community come out to surport this garden. After all as CR Newman said Ït’s only a garden’.